I think there are things I do like about Christmas. I like making decorations, and hanging them. I like making and choosing gifts for people I love, and I like being home with my family. Our second Christmas without Florence. She would be 17 months old today. Maybe she'd have a few little curls at the nape of her neck, and maybe those curls would still have the hint of red I thought I saw when she was born. Would she have green eyes like me? We glimpsed a sliver of blue once, but her colouring was more like mine, so maybe by now they'd be green or hazel like Eden's. The sobs choke me, out of nowhere, and then Ernest smiles and he's so irresistably squishable, and my heart aches and melts, the tears of joy and sorrow burn my cheeks. Some posted a poem on their facebook page which was written by someone called Christine Bevington. I think it's beautiful and hope you don't mind me sharing it with you. ...The fairy lights less bright. Because that comes from inside the heart. You can’t open the ones to you. Our beautiful baby, the heavens took. Even more on Christmas day. This speaks to me...thank you for sharing. Remembering Florence, and sending love to you and your family. Oh Jeanette. 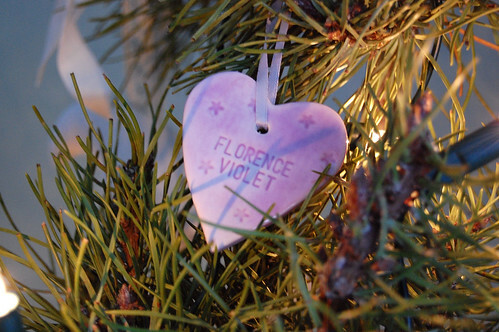 I'm so sorry that you are missing your little Florence this Christmas. I wish you knew for certain the colour of her hair and of her eyes. I seem to be falling into the chocolate and mince pies trap too. what a lovely decoration. This year for the first time I was thinking of making decorations for those missing because they left us too early. It's always this time that it hurts the most, at least for me. I didn't manage but there's always next year. Hoping you can find some joy at Christmas amidst the grief. sweetie I am so sorry, as I couldn't give you a hug I sent you all the next best thing...It is a "We are thinking of you all present" (not a Christmas present as we had an agreement about that,) but the other day you seemed so sad in your post, and again today. The purple heart is beautiful, simply beautiful. The missing just hurts, doesn't it? I can only imagine how it feels to have one of those holes in your family, so I can only send you my warmest wishes for a peaceful and quiet Christmas without your precious Florence.